When you dream of Ireland you probably think of pristine landscapes and warm friendly welcomes. But I also think of incredible food, made with Ireland’s world-class ingredients, and boasting unrivaled flavors and unique tastes. Ireland boasts many award-winning artisan food producers. 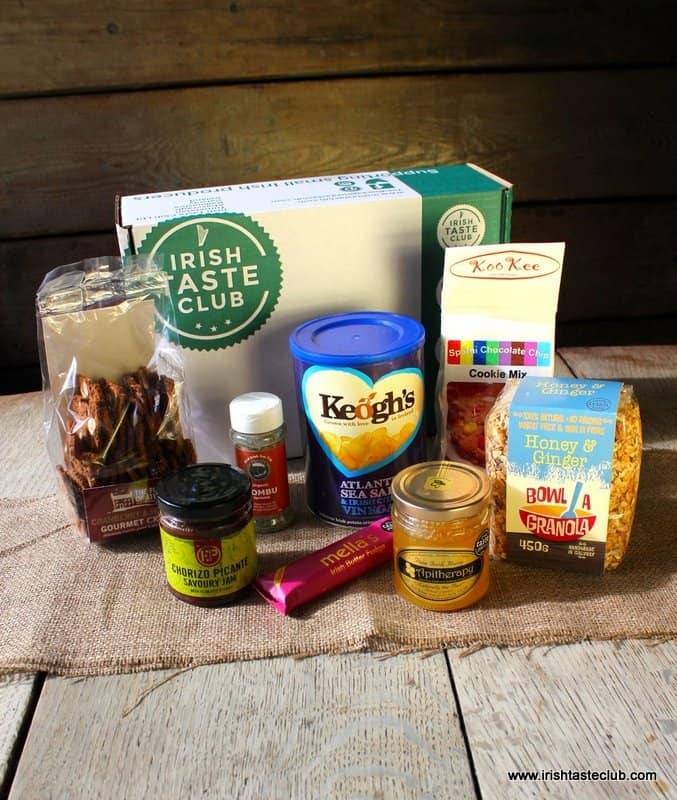 A new company, The Irish Taste Club, is now offering the opportunity to have a monthly flavor box, with samples of Ireland’s finest foods, delivered directly to your home or office. To continue our run-up to Christmas I’m delighted to host another giveaway for a wonderful Irish prize. But first I’m going to hand you over to Barbara Collins, Chief Taster at Irish Taste Club, so she can tell us about this exciting new venture. 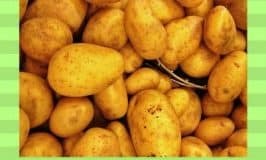 So, you love Ireland and you love food? So do we. 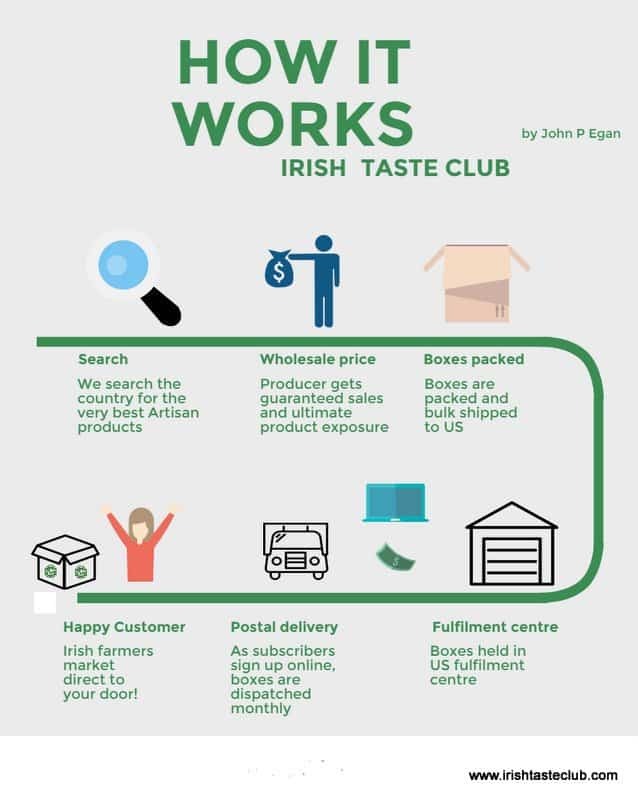 That’s why we decided to start a subscription service from Ireland to the USA for people who want to get hold of the award-winning artisan produce they taste in Ireland but can’t easily get back in the States. It’s tough sometimes, you know, tasting sinful salted caramel and shiny handmade chocolates before moving onto moreish marmalades and crunchy crisps, but we do it so you can get that “Mmmmm” with every bite. So, Where Did Irish Taste Club Come From? Well, it was founded by a Galway guy, JP Egan. He was reared on a farm. He has worked in Beijing, China and for Kerry Group foods but wanted to start a business where the small producer could get a direct route to the US market. His experience in buying means he is able to secure a good fair price, which means your subscription box is value for money as well as being full of delicious goodies. He also knows how to get things to where they need to be. Between us, and a few others like Conor and David we scour the country searching for those high-end foods, with a shelf life, that are being made by a growing band of passionate foodies like ourselves. There are literally hundreds of products to choose from and we work hard to find the best. In each Flavor Box, there will always be a selection of sweet and savoury and of things you can eat straight away and others you can cook with. Every month, we select 7-9 items that we know you will love. Foods of Athenry Gourmet Sodabread Toasts with Honeyed Almond and Rosemary. There will also be a brochure with some suggested recipes. We’d love to hear what you do with your stuff. The boxes can be delivered to your desk or door. It’s like an Irish Farmers’ Market by mail. Simply sign up at Irish Taste Club. Keep in touch with us on Facebook and Twitter. We love to hear from our customers over the pond. Slán libh. (Pronounced slawn liv and means ‘Goodbye to all’). 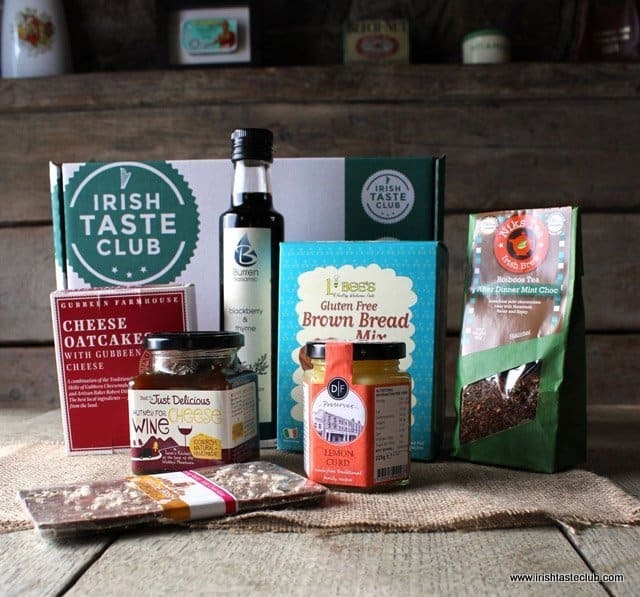 One lucky reader will win a flavor box from Irish Taste Club, which comprises a selection of the best small-batch products sourced from independent makers across Ireland. Each flavor box typically includes 7-9 sweet and savory products including handmade chocolate, artisan jams and chutneys, or baking mixes. A big thank you to Ireland Taste Club for sponsoring the prize for this little Christmas giveaway. To enter just leave a comment on this blog post by noon on Sunday, December 20th, 2015. Any comment will do. 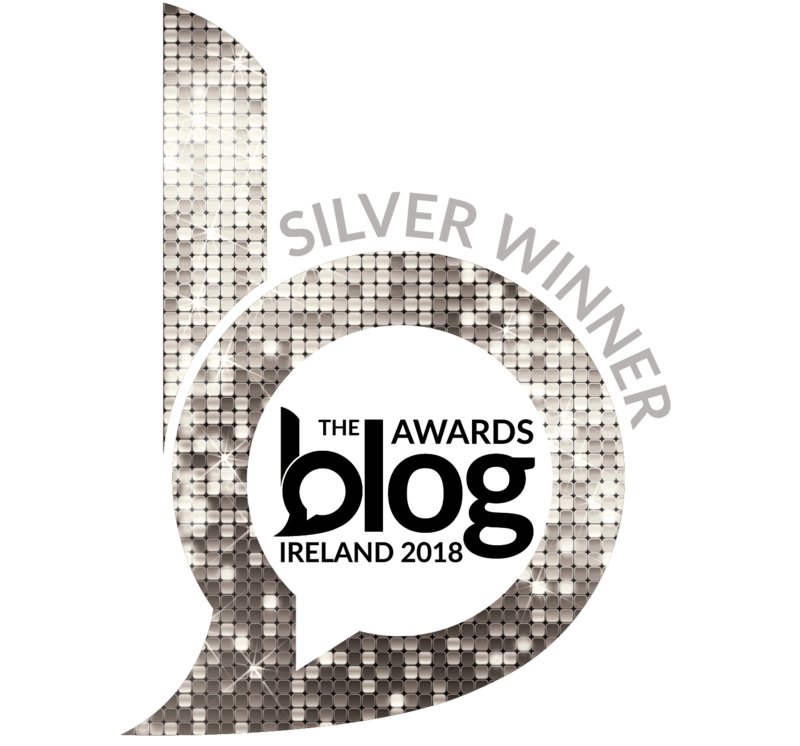 What you write does not affect your chance of winning, but if you need inspiration for your entry why not tell us about your favorite Irish food, or taste of Ireland you would like to sample. Winners will be announced on Sunday December 20th, 2015, at the bottom of this blog post. Best of luck to all the entrants. And a big thank you to the good folks at Irish Taste Club for introducing us to their company and for sponsoring this tasty prize. My husband and I took a trip to Ireland about 4 years. We were very impressed with the food. Not only was it delicious, it was piping hot every where we went. I’m still not sue how they did it! I would live to win a boxing Irish goodies. Merry Christmas everyone! Fantastic giveaway! Would love to win to share these lovely treats over Christmas with my sister. What a great idea! 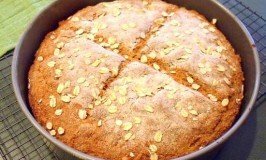 My favorite Irish food – it wasn’t a single food, it was the breakfasts! I ordered the full “Irish” breakfast every day we were there. Didn’t need a lunch. Oh how I wish I could just order up one of those every morning. Recently I’ve been wanting to try Colcannon. Pick me! Oh please pick me!!! Lol! What a great giveaway! Thank you for bringing a little bit of Ireland to the US. My Irish husband can’t do without his flavahans porridge and I can’t drink anything but Lyons tea! Again, hoping for the luck of the Irish! Yum, such a wonderful giveaway. Thank you. What a great give-away! I always wanted to try a full traditional Irish breakfast with, with tea, of course! All I can say is Yum! I love this idea. This sounds lovely…tastes from my ancestral home. What a great idea. This will make Christmas shopping so much easier! Every month, OMG!!! Great way to keep the “Irish” feeling alive and in the forefront. wow- what fun, i have get that for my mom! thanks for the giveaway! What a wonderful idea and opportunity!! Thank you so much. My favorite Irish food is Kerry Gold butter. I think it must be the gold that is in the pot at the end of the Rainbow! So delicious and much tastier than butter from the U.S. Thank you for a chance at a great giveaway. I loved the food in my trip to Ireland!! This would make a most delicious and wonderful Christmas gift! Great idea! I would absolutely love to win this box full of goodies. I have always wanted to visit Ireland and see the land that my ancestors came from. This would be a tasty mini-vacation! What an incredible giveaway!! Thank you for these amazing prizes and your great articles. It’s always a pleasure to read them. Oh how I would love this tasty prize! Really would give my Irish roots a real treat. This couldn’t be more fun of a give a way! Thank you for the chance. This is an awesome giveaway! My favorite Irish food to munch on is chips and curry and husband loves corned beef . . . We’d really enjoy sampling these artisan foods. 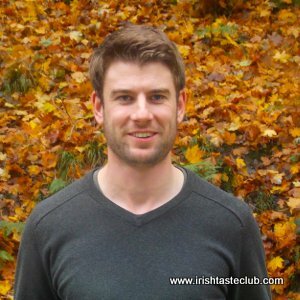 JP here founder of Irish Taste Club. Thanks so much for all the enquiries and interest in our new start-up, as a farmer from the west of Ireland I’m really excited and proud to share Ireland’s best produce with you. Also, thanks to Mairead for letting us share our story with you. Congrats to Deirdre! We are working to get your prize to you asap. 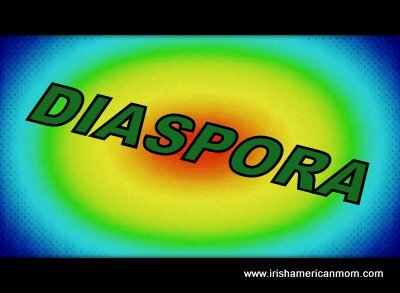 For those of you that haven’t been in touch already, we have a 10% sign up discount code just for Irish American Mom’s readers from now until Sunday 17th January. You can get in touch with me directly on [email protected] for the code. Hi JP – Thanks so much for sponsoring this giveaway, and for letting us know about your new company. It’s a wonderful idea. 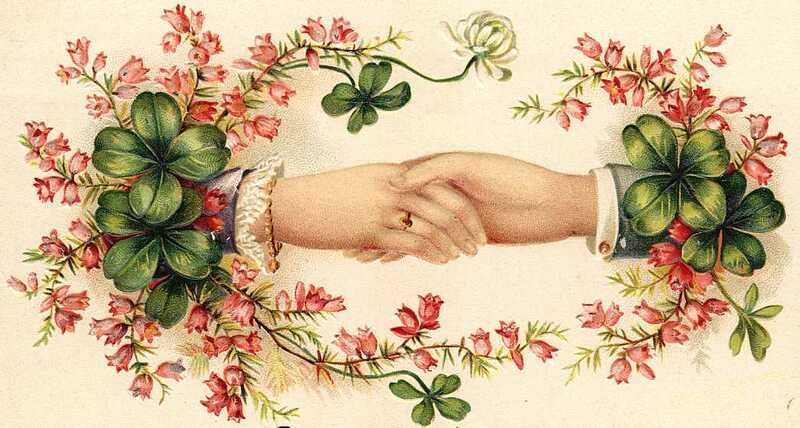 Wishing you every success in 2016, and thanks for making this discount code available to readers of my blog.